Should the city council’s historic images of York be free to use online? Did you think they were? Not so. Old photos, aren’t they great? Well, this one isn’t that great, it’s faded and battered. Found in a pile of old family photos. But it prompted an interesting discussion, as old photos always do. City of York Council’s online archive has many better photos of Tanner’s Moat. And many other photos relevant to aspects of York’s history discussed on these pages. I often link to them, because of that. If they were free to use I would include them on the page, but they’re not. 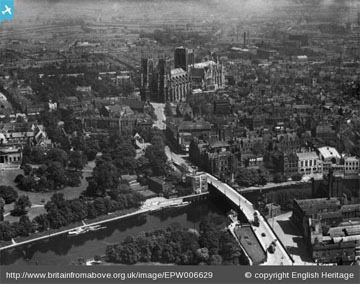 Recently I’ve seen so many old images of York from the CoYC archives (and The Press) posted on Facebook that I began to think they must have all been released into the public domain at some point without me noticing. An employee of the council had told me last year that their images were copyright free, which is why one of them appeared on this website for a while. Until I checked, found they weren’t, and removed it again. I wish I hadn’t checked. I wish I’d just got a load more. Everyone else has, after all. The fee is negotiable and depends on what the photos are to be used for, but, and this is the important point, the archive is ‘mandated by Councillors to charge a fee for reproduction of CYC copyright images’. In 2012 the standard charge was £30 per image for a world license (required for a website). If archivists are mandated by councillors to protect the images they own it seems odd no one’s pointed this out on Facebook, in a public kind of way, where the theft is most obvious. So many council departments have a Facebook presence. It would presumably be easy to post ‘This image is copyright protected and we are mandated by councillors to charge a fee for its use’. But I haven’t seen that posted anywhere. So as it is at present, if you do the right thing and ask the council if you can use images from their archive for free they say no, but if you just grab a copy of them and stick them up on Facebook then that’s fine and no one says anything. We’re all aware that we’re fighting a losing battle and that once any image is online it will just be grabbed, regardless. But perhaps it would help raise awareness of copyright and intellectual property and image licensing if the larger organisations made at least some effort to point out that their images aren’t actually there for the taking. It might be easier just to let them go, and change that mandate. Many people I’ve spoken to think that photos owned by City of York Council should be freely available for residents to use without charge, as ‘we pay our council tax’. It couldn’t be restricted to York council tax payers, of course — on the web they’re open to everyone. Also, their online archive is complicated, as it includes images from regional newspapers and many other copyright holders, not just City of York Council owned images. But perhaps many of the images owned by CoYC should be in the public domain. As I can see many already are, unofficially. And maybe there’s nothing wrong with that. The council’s collection of images includes some conventionally attractive and desirable photos of York. I can see why they would want to hang on to their rights to these, and sell them. On the other hand the archive also includes many photos rather dull and obscure and of very limited interest. I noticed images posted to Facebook of the construction of streets in Chapelfields, in Acomb, York. The only people who would be interested in those are people who grew up there, or who remembered them being built, or people in years to come tracing their own histories. The images have no commercial value and the city council would never make any money from them. 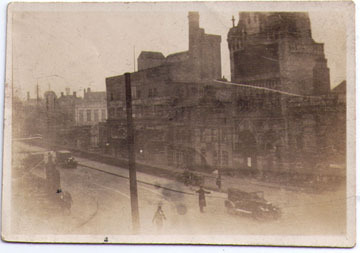 Similarly, years ago during family history research I found a brilliant image in Hull council’s online archive. Brilliant only to me and to a handful of other people in the entire world — the local authority happened to have captured some ordinary terraced houses where my ancestors lived, before those houses were demolished. The local authority images are probably the only record. Being stupidly polite — a habit I might give up online — I asked about permission to include the photo on a website about my Hull ancestors. They said no. Because they had to protect their images against misuse. The image in question was a photo of an ordinary terraced house in Hull. Very little chance anyone but me would want it. I was also adding my own ‘value’ to their image by adding to its history, linking to it the names of some of the brief lives lived there, which I happened to know about. That was around six years ago, but I haven’t forgotten it, and was reminded of it when seeing those photos of the Chapelfields estate, owned by our own local authority. Perhaps the council has to accept that it can’t control what happens to its images online, and change that apparently ineffective mandate. It could retain a link of ownership by adding a mark of some kind — the city arms logo seems appropriate — in the top corner of the photos. Rather like has been used in the fantastic collection of aerial images on britainfromabove.org.uk. If they can do that, why can’t the city council do something similar? It seems they need to change their mandate, as it’s clearly not enforceable online. If they want to keep the mandate to charge then they have to make more effort to enforce it fairly and consistently, which would probably require an extra team of archivists just to police Facebook, where scores of photos from their archive are posted every week. I wonder what others think. Your thoughts welcome below. By Lisa @YorkStories • 17 June 2013 Opinions, thoughts, Web/website matters To link to this page's proper location please use the > permalink. The archives York Council posess belong to us, the people of York. York Council and their assets ony exist as an extension of the people of York. I also understand that these assets should be protected, especially from commercial use. It should be the duty of York Council to extract any commercial benefit they can from their assets, and use that benefit for all of us. The images should be held under a Creative Commons license, a license that can be used to allow free use of the images for non-commercial purposes. This seems a simple and straight-forward solution, protecting the asset while allowing people to use and distribute the asset to the benefit of all. Have thought before about putting my own photos under a Creative Commons license, but think many don’t look at the requirements of the different types, would just see ‘Creative Commons’ and think ‘free and with no restrictions whatsoever’, which of course isn’t necessarily the case. I guess that whatever license type is set some will respect the terms of it and some won’t. I don’t think there is a simple and straightforward solution, but anything is better than the current setup CoYC have. Your point about adding value to an image seems particularly important when it is part of a public archive. Encouraging wider exposure can only benifit that process as well as bring to light any inaccuracies in catalogue descriptions. Like you I find it fascinating to find images which enrich my understanding of my family history. Through it first coming to my attention on Facebook I found a photograph from the City archive of where my grandparents lived and was interested in dating it to see if it was when my mother was a child there.The catalogue said 1910’s but I was rather proud of myself in using the telephone box to date it close to 1929 (if I remember). I emailed the library pointing out the mistake in their catalogue and despite this being some months ago they have not bothered to change it. I like your use of a phone box to help with dating the image. You’re right that wider exposure can mean more people are able to add the ’story’ to an image, but I suppose that only works if the photo retains its context and the information stays linked. As you know of course the council’s online archive already contains background information carefully added by volunteers, and if the photo is copied to Facebook or wherever without that link it means that useful information is lost, and added comments are adrift from the place where they’d be of most use – still linked to the image in the local authority archives. Yes, it was the “Tell us more” facility I used. I was lucky with the telephone box. It was a model that was in use for a very limited time. At the junction of Poppy Rd and Acomb Rd if you are interested in seeing it. Easily found in the archive. I don’t disagree that linking is important. Pity the poor archivists – they have lots to do, are probably facing lots of cuts, and so their ‘to do’ list for making catalogue corrections to individual items (which are not revenue-raising…) is almost certain to be growing faster than they can spare the time to make the corrections. Indeed I’m sure you’re right Chris, and certainly York Libraries and Archives are undergoing a lot of changes at present, probably rushed off their feet already. I have to say that personally I’ve always found the archive and library staff really helpful, and that this page was no way intended as having a go at them – it’s really only about asking questions about an outdated and unworkable rule. Attempting to enforce it would give them even more work to do. Which is why I hope the authority will stop insisting on implementing a charge for web use, as it’s clearly not working.